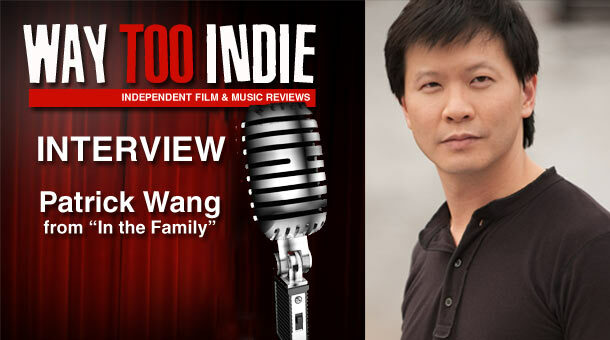 Patrick Wang was the writer, director, lead actor, and even self-releasing his film, In the Family (review), which he received an Independent Spirit Award Nomination for. He talks about the adjustments he had to make from his theatre background to film and why he decided to keep the score of the film to a minimum. So I have read why you decided to have it set in Martin, TN but why did you decide to shoot in Yonkers, NY? That’s a great question, and in the future I look forward to shooting in many different parts of the country. But this was my first film, and New York is home now. With all the new challenges that would be coming my way, I thought it would be a good idea to be able to come home to someplace familiar at the end of the day and be close to my support system of friends. Yonkers is close to New York, is similar in climate to Martin, and parts look very much like Martin. It also has another connection to the movie: Chip Taylor is from Yonkers. It seems like you would have had to know Chip Taylor was going to be a part of the film from the beginning, since one of the characters was named after him, is this true? I had written Chip Taylor into the script but not so deeply that we couldn’t change things if he didn’t like the project. I sent him the script to read, and fortunately he liked it. He has been a great friend to the movie and to me. Speaking the score, In the Family remains largely absent of one, what was the reason for this? One of our audience members made the beautiful observation, “Some movies make you think, this one lets you think.” I tried to combine a strong visual perspective for observing the scene with neutral perspective on interpreting the scene. The deep focus allows your eye to follow many different paths through the scene, and the lack of score lets your emotions follow many different paths through the scene. While riskier, the result can be a much more personal and unpredictable experience. Because there was many single-take long scenes which sometimes involving a child actor, how were you able to keep him focused throughout the scene? Was it a constant struggle? The most challenging scene with Sebastian was the long take for the opening kitchen scene. He has a lot of lines; he’s moving around and handing a lot of props at the same time. But honestly, it was a challenging scene for all of us. I had a line flub in one of the takes, and I barely had any lines in the scene. Sebastian is extremely focused as it is for a six year old, but when he needed some help, I’d try to make a game out of the scene and give him something new to do. It took only three weeks to shoot the film but approximately how much did it cost to make In the Family? It was just under half a million. A significant amount of that was for the filmout and making 35mm prints for a 169 minute movie. The film was rejected from several film festivals before finally being accepted into some, do you think the run-time was the biggest culprit? Your guess is as good as mine. We have only heard back from one of the festivals very recently. They apologized and acknowledged they had only watched the first few minutes of the film. You are going to be self-releasing the film this spring, what do you believe is the toughest hurdle to getting picked up? Each film has its different hurdles, and with this film, I feel the biggest hurdle is that I am facing a distribution industry that has adopted risk minimization as its behavioral norm. Not risk optimization, risk minimization. In the short run, this lets you grasp at the disappearing pie. In the long run, it kills innovation and future commerce. Any interesting fact you can share about the film that a viewer would not know from just watching the film? Even though they get cut up in the final edit, the two wide shots in the deposition scene were shot as single takes of the entire scene, each take over half an hour long. I remember how exciting the first take was. Everyone thought we would cut at some point, but we did the whole damn thing. What influences from your theatre experience transferred to this film? What was the most difficult adjustment for you? From theater, I get my love of performance and literature. I also learned from working with designers in theater how to see and listen. That’s most of what I needed to make this film. I think the most challenging adjustment I found in moving from theater to film is that the environment on a film set can be very distracting to the actors’ work. My AD and I worked hard to find ways to make the set culture more performance-friendly. Yes, I’m working on writing a screenplay based on Leah Hager Cohen’s novel “The Grief of Others.” It’s a gorgeous novel, and I’m looking forward to figuring out how film can try to keep up with the density and dexterity of a novel.